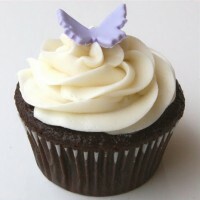 Often the most beloved element of a cupcake is the frosting. 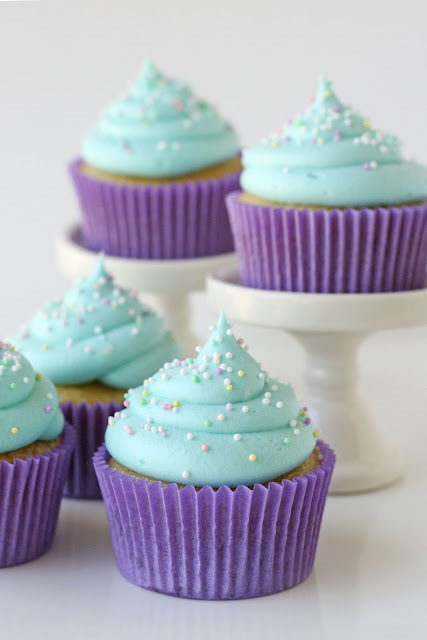 A good frosting can elevate a simple cupcake to a delicious, rich dessert. Classic American buttercream is surprisingly easy to make, and can be adjusted to your personal preferences using added flavorings, and adjusting the ratio of the ingredients. American buttercream is simply a combination of butter, powdered sugar, vanilla (or other flavoring), and usually a bit of milk or cream- that’s pretty much it! The frosting I love to use the most often is my Cream Cheese Frosting, which is simply a variation on American Buttercream, with some cream cheese added. Free free to play with this recipe and adjust it to your palate. 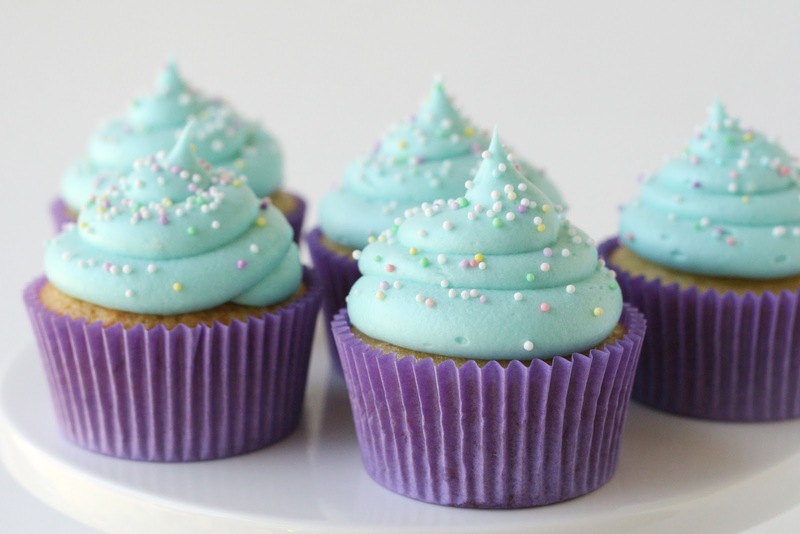 This is a very sweet, classic frosting that pairs well with most any flavor of cupcake. *Optional- As mentioned above, I like a cream cheese version of this frosting best. The cream cheese adds to the creamy texture, and cuts down on the sweetness just a bit. If desired, for a very light cream cheese flavor add 1/2 block (4 oz). cream cheese, leaving the other ingredients (as listed above) the same. For a more traditional cream cheese flavor, reduce the butter to 1/2 cup, and add 1 block (8 oz.) of cream cheese. If using a full block of cream cheese, you can reduce the cream or milk to 1 tablespoon total. Flavoring options– An almost unlimited number of flavoring options can be added in addition to, or instead of the vanilla. Orange and/or lemon zest, citrus extracts, mint extract, coconut extract or the seeds of a vanilla bean are all wonderful options. In most cases I’ll still add 1/2 teaspoon of vanilla, then 1/2 teaspoon of the other flavoring. For zest, add about 1 teaspoon fresh zest. For chocolate buttercream, add 1/2 cup (good quality) unsweetened cocoa powder. * Add salt (if needed). * One cup at time, add 2 cups of powdered sugar, beating after each addition. * Add vanilla, or other flavorings and beat to combine. * Add about 1 tablespoon of cream, and continue beating. * Add the remaining 2 cups powdered sugar, one at a time. * Add an additional 1-2 tablespoons cream until desired consistency is reached. If you want to pipe the frosting on cupcakes, the frosting should be nice and thick. Continue to beat another minute or so. The frosting should now be smooth and fluffy. Recipe Source- American buttercream first appeared in cookbooks in the early 1900’s (here’s a little buttercream history) Countless sources since then have included very similar versions, always using some combination of butter (or shortening), powdered sugar, milk and flavoring. The recipe above is simply the proportions I like to use. Try this classic frosting on top of my favorite Vanilla Cupcakes or Chocolate Cupcakes. Hey!! If you add in about 2 oz of cream cheese to cut down on the sweetness, do you have to refrigerate the cake or can it be left out? I would think with such a small amount of cream cheese and such a large amount of sugar, that the sugar would offset it, but I wasn’t sure. Thank you!! Even with 4 oz. of cream cheese, it can still be left at room temperature with no problems. The sugar acts as a preservative. If you live in a super warm or humid climate, then you’ll likely want to keep it in the fridge. Sometimes after I frost the cake or cupcakes I’ll put them in the fridge for up to 30 minutes or so to help the icing really set up, then I’ll pull it out and store at room temperature. Best buttercream I’ve ever made. Added the cream cheese as written and it was perfect. Thanks for the recipe. Will be using again and again. This is the BEST frosting I’ve ever made!! I use it on everything and make it with the different flavoring options. Thank you for sharing your talents! Do I need the butter to be at room temperature? I’ve used this recipe twice. Once with soft room temperature butter and once when I was in a hurry with barely soft butter. It was definitely A LOT easier with the softer butter. It took way longer to get the lumps out of the colder butter. It should also be noted that I was using an electric hand mixer with the whisk attachment and not a stand mixer. Perhaps the stand mixer could make a big enough difference that it wouldn’t matter on temperature. Hi Shannon, Yes, I always make this recipe with a large stand mixer, so that will make a big difference. As you discovered, it’s near impossible to beat cold butter with a hand mixer, so the butter does need to be a bit softer (if using a hand mixer), and then the finished frosting may also be a bit softer (and require refrigeration to firm up a bit depending on the way you plan to use the frosting). How many cupcakes will this frost? I don’t have a whisk attachment, can I use the regular beaters i have? 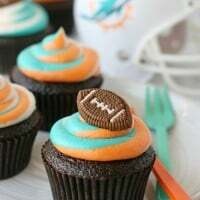 I’m looking to make this exact color frosting for my baby shower! Which food coloring did you use? Thanks! Americolor brand gel in sky blue. I don’t have a mixer, is there another way to make frosting? HI how many days in advance can I make the frosting for a cupcake decorating party? 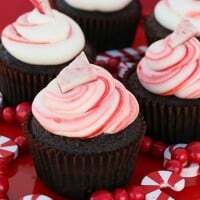 You can make the frosting up to two days in advance, just be sure to cover well and make sure your fridge doesn’t have anything producing a strong odor. I would suggest re-whipping the icing before use. Yes, the equivalent is also listed in the recipe. This recipe calls for a total of a one cup of butter, or 16 Tablespoons, or 1/2 pound of butter. A stick of butter in the U.S. is 8 Tablespoons or 1/2 cup or 1/4 pound. Does this give you the information you need? I’m not sure how butter is sold in the U.K.
Is it possible to use this buttercream recipe to make flowers?